Hecate | Take Back Halloween! When we first decided to do a costume for Hecate—the goddess of witchcraft, the night, and crossroads—we thought we would do a classic Greek look, the way the ancients saw her. But we ran into an interesting dilemma. Hecate is unusual among ancient goddesses in that she has a fully developed modern iconography that is actually quite different from her classic appearance—though she is of course still the same goddess. The ancient Greeks and Romans typically pictured Hecate as a youngish woman in a chiton, wearing a cylindrical headdress and holding torches. The modern version of Hecate is still holding torches, but she’s often depicted as a wise crone in a very wizardish cloak. The gorgeous painting in our main illustration above (by Antonella Platano) is a perfect example. And you have to admit, it’s pretty freaking cool. 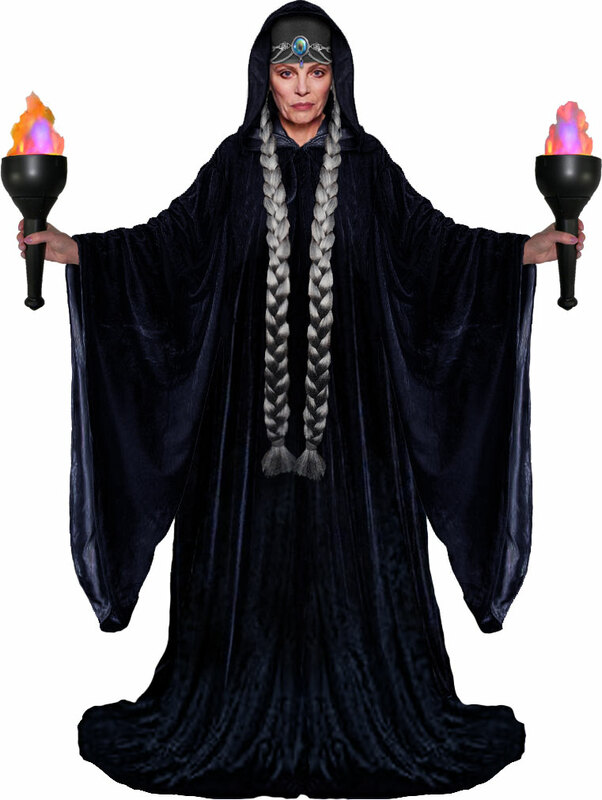 So, we decided to go with modern Hecate. 1. 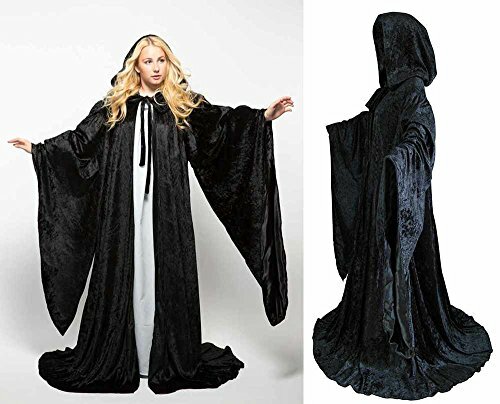 Black velvet wizard robe from Artemisia Designs . Also available at their ebay store . This is a really long robe, so you might want to turn it under in the front so you can walk. 2. 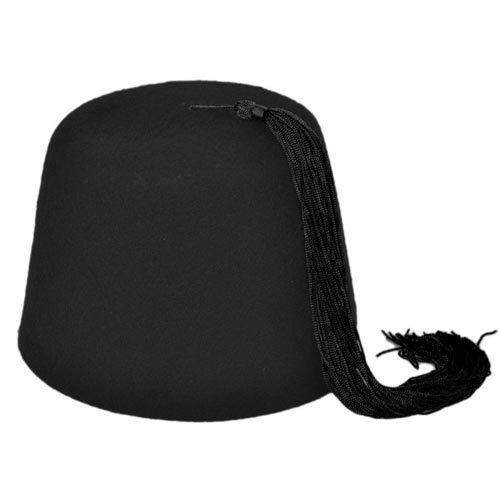 Black fez. Wear this under your hood. It’s a nod to the cylindrical headdress worn by ancient Hecate, and also serves as the base for a fabulous circlet (next). 3. 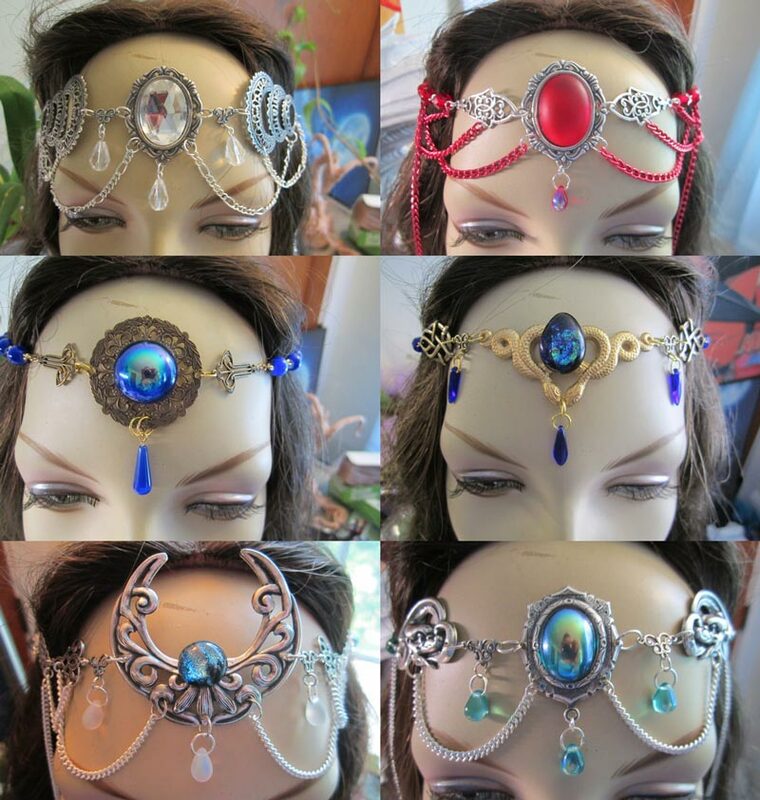 Jeweled circlet from Wynddragon’s Treasures. This seller has a slew of circlets available, most of them in the $20 to $30 range. They’re all different and all fabulous. 4. 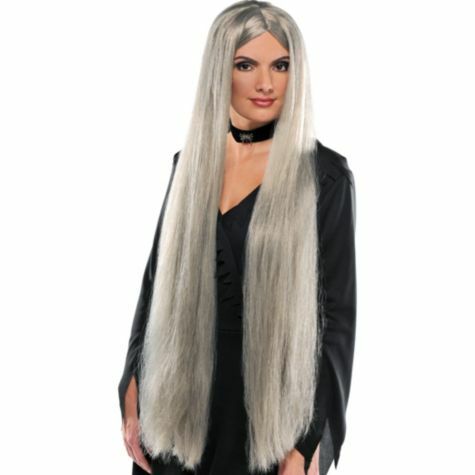 Long grey wig. If your own hair isn’t hip-length grey, get a wig like this and braid it into two plaits. If you find wigs uncomfortable to wear, you can just cut off the braids and attach them to your fez. 5. Faux Flame 4-in-1 Torch . 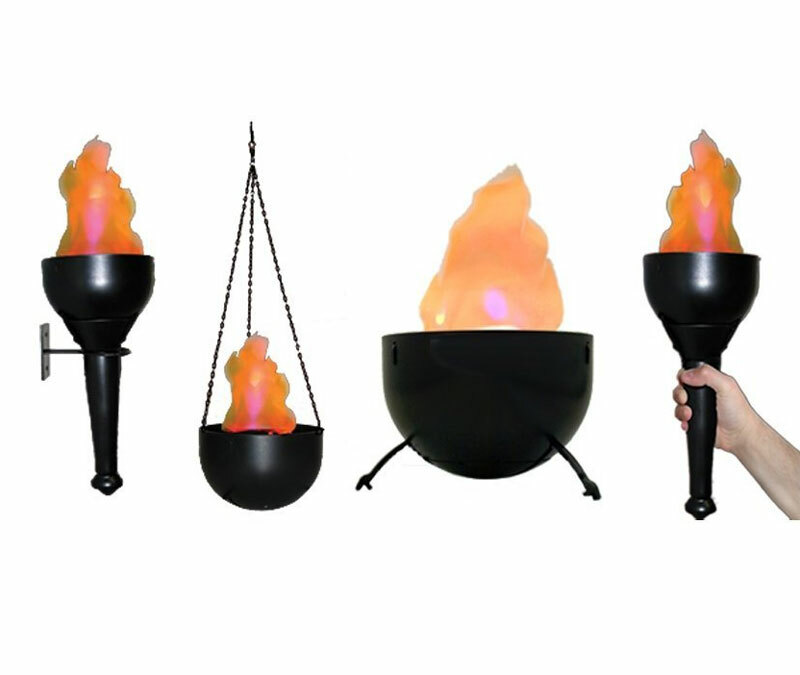 This is a battery-operated faux flame torch that’s convertible; you can hold it as a torch, set it on a table, hang it on the wall, or suspend it from a chain. Here’s a short video of it in action: 4-in-1 Burning Torch Flame Light. Main illustration credits: The beautiful modern painting of Hecate is from the Universal Goddess Tarot, with illustrations by Antonella Platano and text by Maria Caratti (Lo Scarabeo, 2006); Aeclectic Tarot has purchase links. 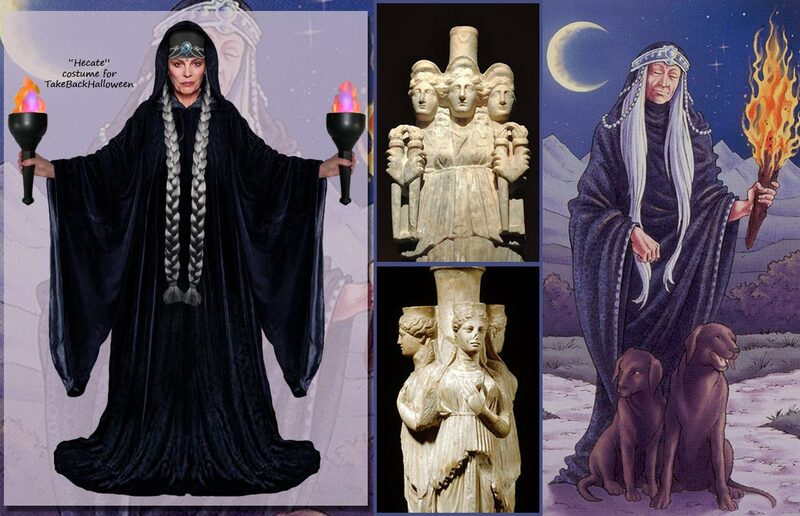 The statues of Hecate are typical of the triplicate forms that were popular in classical antiquity. The statue on the bottom is a Roman copy of Greek original; it’s in the collection of the Dutch National Museum of Antiquities (Rijksmuseum van Oudheden). The statue on top is dated to the third century CE and is in the collection of the Antalya Museum in Turkey.